I am very proud to share the results of the work I did with my friend and coworker Magnar Johnsen from FirstPoint. We have been developing for a long time a smart new way of analyzing data (iOPS, CPU, Memory, GPU, Latency..) and different pieces of software was evaluated and Lakeside Software was the product we decided to go with and both our companies Poppelgaard.com and Firstpoint who are a Lakeside partner so we are legit to make assessments for clients using Lakeside Software. Below article helps you if you are about to size a NVIDIA GRID vGPU solution using either Citrix XenServer or VMware vSphere. If you have been at NVIDIA GTC, Citrix Synergy, BriForum, E2EVC or seen me talking at a Citrix User Group you might have seen the results of the work we did, thats changing on how we think applications are impacting that requires a GPU. Magnar and I go way back. Aibel is an industrial pioneer with a history dating back more than a century. With around 5,500 employees worldwide the company is a leading supplier of engineering services related to oil, gas and renewable energy. Aibel is a huge user of desktop virtualisation technology and is currently delivering virtual desktops to around 4,500 users. The challenge was to work out what to do with the remaining 1500 CAD/CAM workstations where graphics intensive modelling of 3D designs tied them to powerful physical workstations. 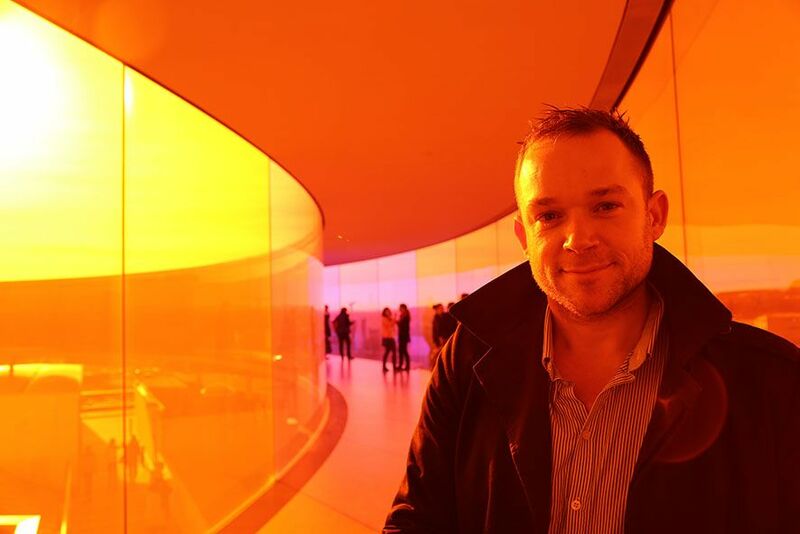 With projects occurring at the eight Aibel locations in Norway as well as at the Aibel offices in Thailand and Singapore the amount of data flowing across the WAN was increasing and becoming unwieldy. Large engineering models needed to be accessed on location and shared with engineers and designers in all Aibel office locations. Virtualisation was seen as the solution to these issues but the challenge was how to virtualise graphics intensive workloads without impacting user experience or drive uneconomic datacentre specifications. Firstpoint AS, a trusted Citrix Gold partner and virtualisation specialists, were brought in to advise Aibel on how to best virtualise this tricky user group. They teamed up with Thomas Poppelgaard, an independent expert in virtualisation and GPU technologies and together they started an initial survey of Aibel’s situation. It became quickly clear that the only way to successfully virtualise the 3D graphics workstations in an economically viable fashion was to deploy GPU acceleration technology in the datacentre. 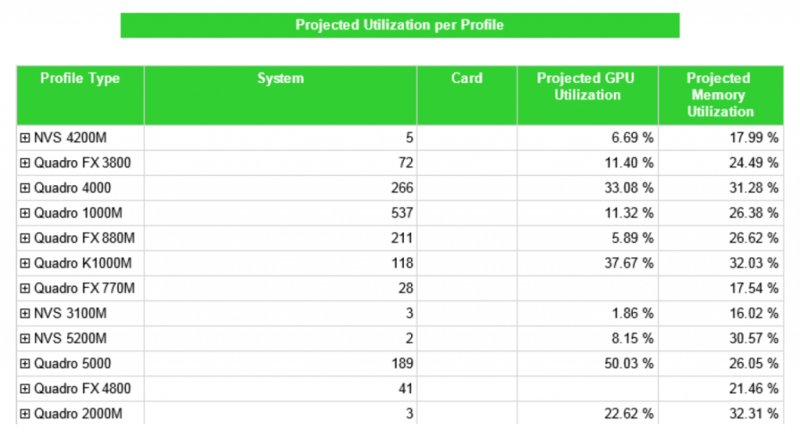 NVIDIA’s GRID cards would allow dedicated and shared GPU accelerators to be placed in the datacentre to be used by virtual desktops offloading server CPUs and removing user experience impact for other virtual desktop users. What GPU processor power is being consumed today by application, user and workstationPoppelgaard.com and FirstPoint brought in Lakeside Software’s SysTrack to do this job. 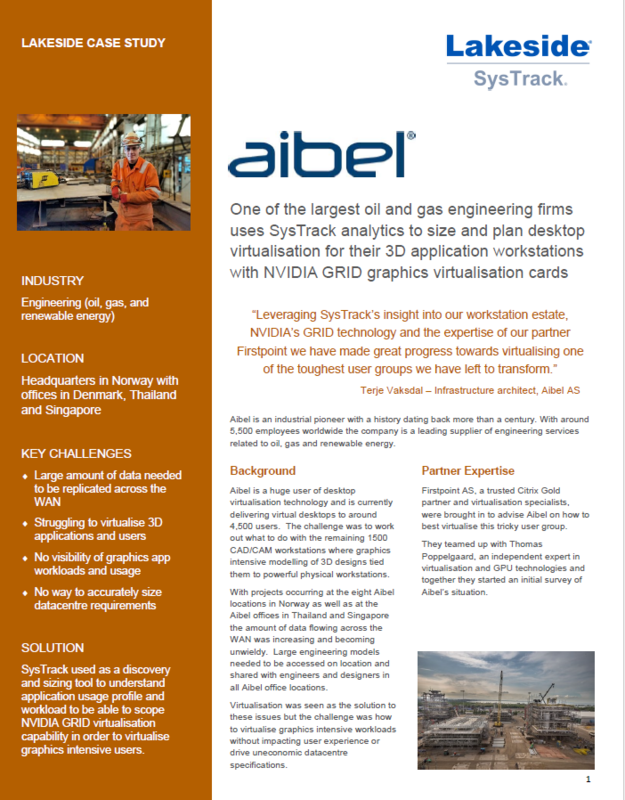 Using SysTrack’s granular data collection model they could model a complete picture of application and GPU workload across all the users and workstations in use at Aibel today. as it is completely based on observed data captured from their existing estate and modelled using industry leading technologies from Lakeside and NVIDIA to create the optimal solution for Aibel’s situation. Key in any design is to not over provision the solution and thereby inflate the cost of the solution. On the other hand under provisioning will lead to a poor user experience and potential project failure. SysTrack ensures the right data is used to make the right decision for the future estate. The assessment was primarily executed to understand Aibel engineers CAD applications such as Aveva PDMS, Bentley Microstation, etc. 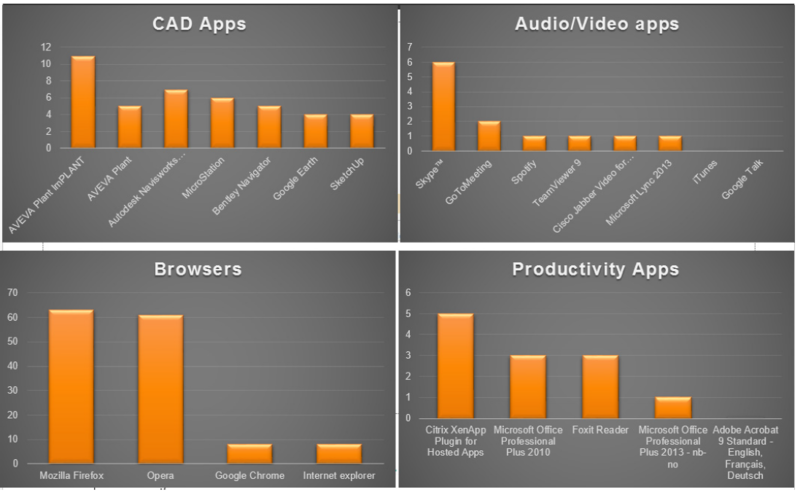 Shown below is a summary of average GPU usage for 1500 physical machines which revealed surprisingly that internet browsers are very GPU intensive compared to other applications. 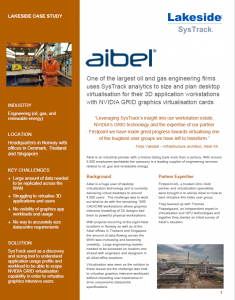 Another benefit of leveraging SysTrack was the SysTrack MarketPlace report that had been co-authored by Lakeside and NVIDIA which allowed the team to convert all the data collected into accurate sizing of the number of NVIDIA GRID cards by model number required to offload the GPU workload. The output from SysTrack also showed how GPUs were being used across the existing estate and how hard they were being utilised. Using jointly authored Lakeside/NVIDIA reports this data was then used to calculate estimated vGPU profiles.